I am constantly preaching about how much better chicken is on the bone. 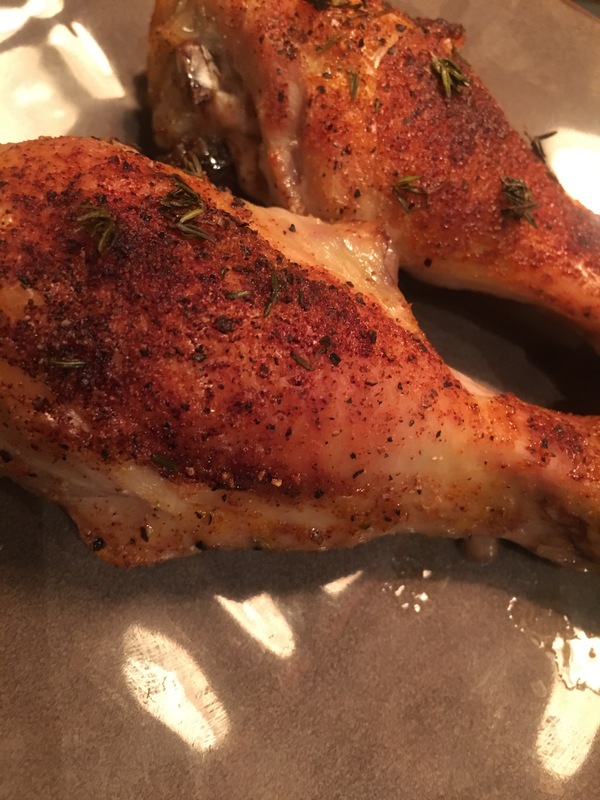 I love a good fuss free chicken breast that I can dig right in to, but the flavor benefits of bones are worth carving around. Now that it’s getting a little cooler outside, it’s safe to crank the ovens on again without melting. I have recently fell in love with citrus on my meats. A little lime, orange or lemon juice brings a fresh and vibrant flavor to any dish. 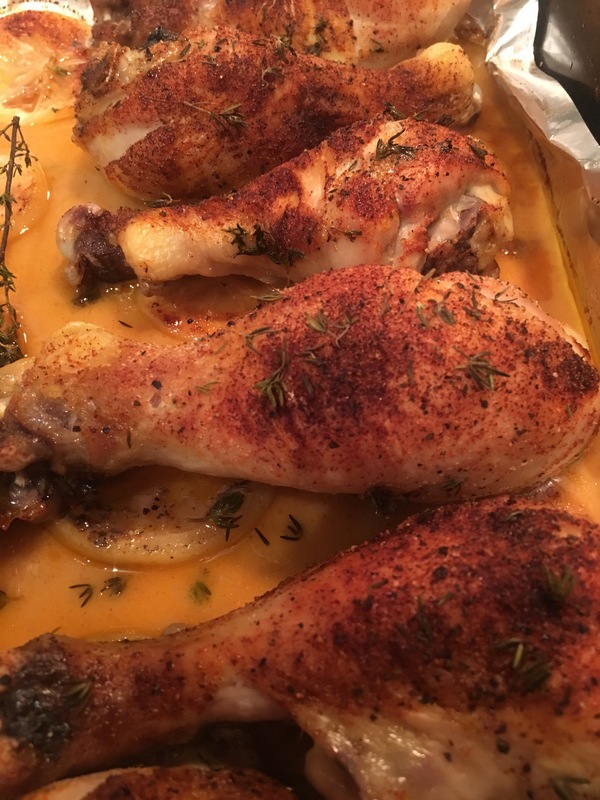 I decided to incorporate lemon with earthy thyme for this chicken. The flavors work so well together and compliment instead of over shadow one another. I place the lemons on the bottom versus the top to avoid making the chicken sour but while the chicken is in the oven, the lemons will steam from underneath and add the right amount of pizazz. Yes, pizazz is a word. On a foiled baking sheet, place lemon slices to cover the bottom of the tray. Then place your chicken on top. Sprinkle evenly with your spice mixture. Then add an equal amount of the chopped thyme on top of drum sticks. 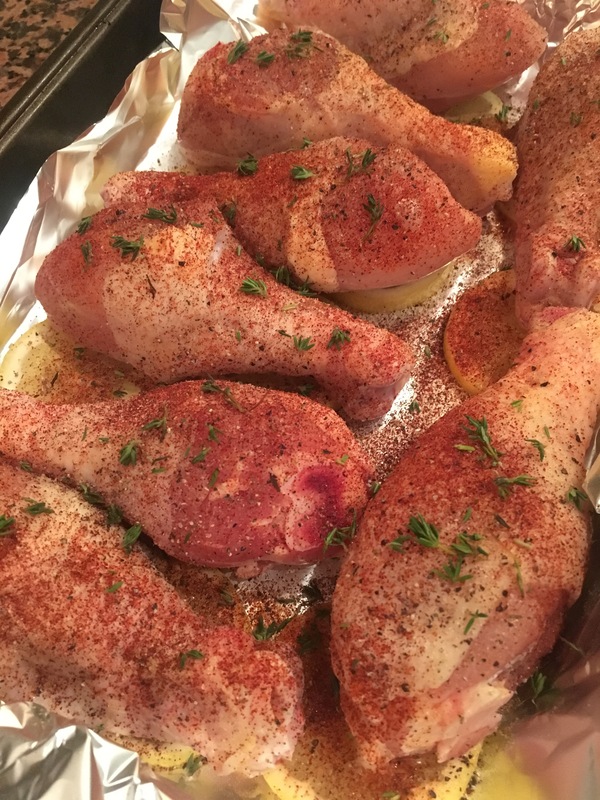 Pour 2 tablespoons of olive oil all over the chicken. Bake at376 for 35-45 minutes defending how big the drum sticks are. The meat will fall right off the bone!